Then vs. Now: What is the Family Circle? Have you ever noticed the “Family Circle, 25 cents” sign that is posted on the façade of Ford’s Theatre? While today's Family Circle isn’t the same as it was when President Lincoln attended the Theatre, its history tells us a great deal about the atmosphere of theatres in the 1860s and how the Fords wanted their theatre to be different. 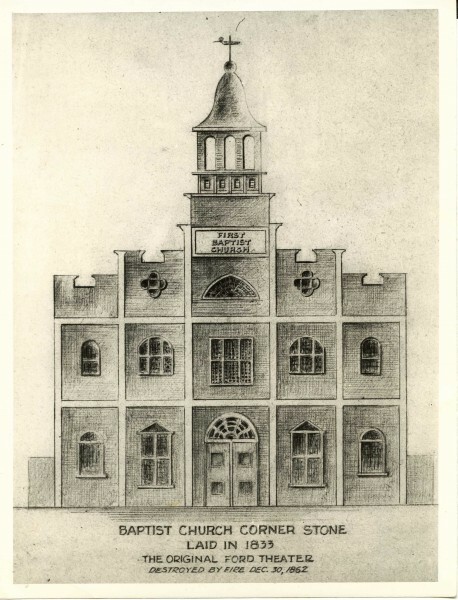 Ford's Theatre was originally a baptist church, as seen here in this archival sketching. When Ford’s New Theatre opened to the public in 1863, it offered three options for seating: the orchestra ($1), a second Dress Circle level (75 cents) and the third level known as the Family Circle (25 cents). Nineteenth-Century theatre audiences were raucous, and the upper tiers were often the scene of loud conversations, laughter and even heckling. Many theatres had the reputation of being seedy, often hosting prostitutes in their upper balconies. This sort of theatrical atmosphere was not a suitable place for children to gather. By naming the third level the Family Circle, Ford set his theatre apart from the stigma his rivals faced. While the theatre’s lower sections had individual seats, the Family Circle featured wooden bench seating, like that of a meeting house or church. This first-come seating fostered a casual, communal atmosphere where happenstance determined where patrons sat and in what configuration. Children sat on the laps of parents and the Fords squeezed as many people into this space as possible. According to the National Park Service’s Historic Structures Report, the original Family Circle area could hold 600 guests. This number seems staggering, as Ford’s Theatre today reaches total capacity at 655 seats! 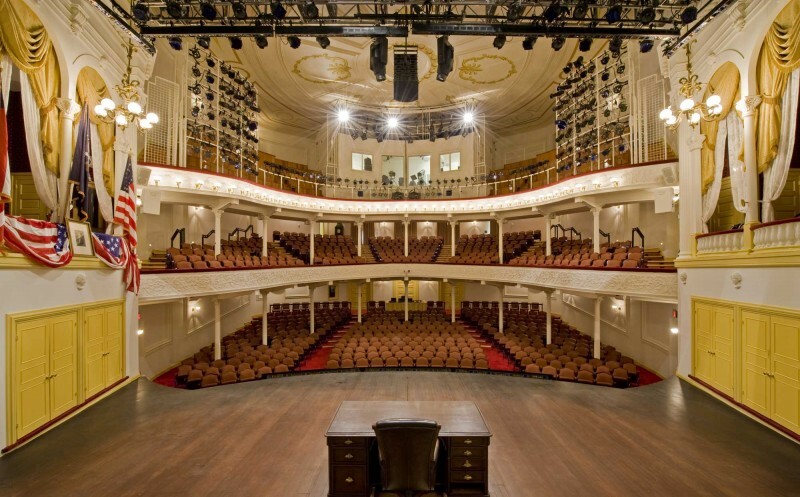 Following Abraham Lincoln’s assassination on April 14, 1865, the War Department commissioned the theatre for use as an office building and storage facility. After a total building remodel, what was once the Family Circle was then filled with records from the Army Medical Museum until the early 20th-Century. The Family Circle old is no utilized for patron seating at the modern-day Ford's Theatre. Pictured here in the second balcony, the space now houses the Ford's Theatre lighting booth. Photo copyright Maxwell MacKenzie. The first restoration of Ford’s Theatre began in 1965. The goal was to return the theatre to its 1865 appearance. Architects used a number of Mathew Brady’s pictures, taken in the aftermath of the assassination, and historic floor plans to redesign the majority of the theatre’s interior. The theatre reopened in 1968 as a historic site and working theatre. The Family Circle was also refurbished during this renovation, though the area wasn’t ever opened again for viewing performances. With the advent of modern theatre lighting and sound, the theatre had to again modernize its use of space in the last decade. Visitors cannot sit in the Family Circle area today because it’s occupied by lighting equipment and the technical booth, from which stage managers and theatre technicians run the stage performances. A person seated high above the stage with 600 other visitors would have had a much different experience than that of theatregoers today. The next time you’re in the theatre, look up. Imagine the Family Circle full of noisy patrons laughing and chatting. That was the Ford’s Theatre of the 1860s – and it only cost you 25 cents ($3.81, accounting for modern inflation) to experience it. Kelsey S. Johnston is former Ford’s Theatre Marketing and Communications Intern. She is passionate about the use of new media and digital technology within museums as a means to educate and communicate with visitors, both in person and online.